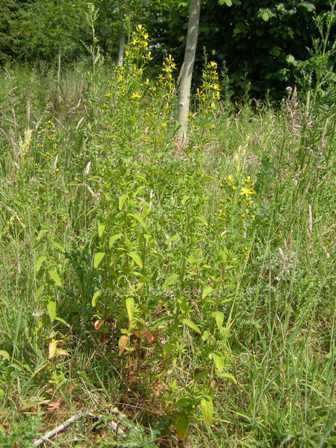 Throughout the UK, Europe and the Near East many St. John's-wort species grow both in the wild and as cultivated plants in gardens. One of the most beautiful of the European species that grows in the wild is Hypericum olympicum which has very large flowers measuring up to 5.5 cm in diameter. Hypericum calycinum, more commonly known to us as Rose of Sharon, originates in the Near East, and has even larger flowers - around 7 cm in diameter - and this is the species most familiar to us from gardens and parks throughout the UK. It is an agressive shrub which has become widely naturalised in the countryside, and can often be seen on roadside banks and verges, and also along railway lines. 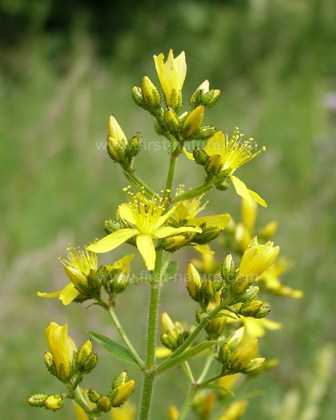 Other species from the UK include Trailing St. John's-wort (Hypericum humifusum), Marsh St. John's-wort (Hypericum elodes), Slender St. John's-wort (Hypericum pulchrum) and Perforate St. John's-wort (Hypericum perforatum). The so-called perforations which give the latter species its name refer to translucent dots on the leaves of the plant which look like holes when held up to the light. These perforations are, in fact, resin glands which exude the somewhat unpleasant smell which is associated with members of the Clusiaceae family. St John's-wort blooms in summer and early autumn, and in the countryside can generally be found in hedgerows or on rough grassland that is moderately well shaded. The flowers are guaranteed to be at their peak around Midsummer Day and have a long and ancient history associated with various festivals and processions that have taken place (and still do in some European countries) around this time of the year. The Feast of St. John the Baptist takes place around the same time - 24th June - and from this the plant derives the common name used today, and which superseded other names given to the plant in ancient times when it was used in Pagan rituals at mid-summer.